Reading and share top 7 famous quotes and sayings about Resurrection Power by famous authors and people. Browse top 7 famous quotes and sayings about Resurrection Power by most favorite authors. 1. "Let us beware of tinkering with our inner life in hope ourselves to rend the veil. God must do everything for us. Our part is to yield and trust. We must confess, forsake, repudiate the self-life, and then reckon it crucified. But we must be careful to distinguish lazy `acceptance' from the real work of God. We must insist upon the work being done. We dare not rest content with a neat doctrine of self-crucifixion. That is to imitate Saul and spare the best of the sheep and the oxen.Insist that the work be done in very truth and it will be done. The cross is rough, and it is deadly, but it is effective. It does not keep its victim hanging there forever. There comes a moment when its work is finished and the suffering victim dies. After that is resurrection glory and power, and the pain is forgotten for joy that the veil is taken away and we have entered in actual spiritual experience the Presence of the living God." 2. "The Holy Spirit was poured out as the fruit of Resurrection and Ascension. And the Spirit is now the Power of God in us, working upwards towards Christ, to reproduce His life and Holiness in us, to fit us for fully receiving and showing forth Him in our lives.We must take the lesson to heart; we can have as much of the Spirit as we are willing to have of His Holiness. Be full of the Spirit, must mean to us, Be fully holy. [. . .]Be holy means, Be filled with the Spirit. If we inquire more closely how it is that this Holy Spirit makes holy, the answer is,—He reveals and imparts the Holiness of Christ." 3. "When we came to Christ, it was humility to honestly assess ourselves as sinners. To go back and say that's still who we are is to deny what Christ did for us. Doing that is no longer humbling ourselves, it's undercutting the resurrection power God has given us to live like Him." 4. 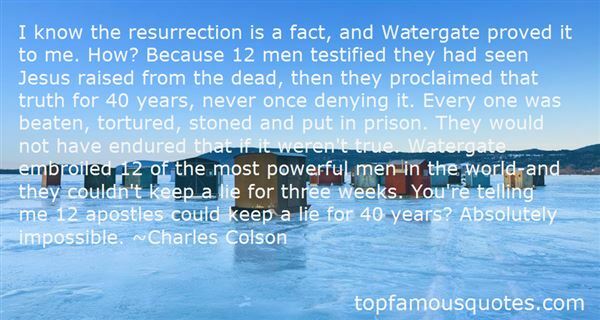 "I know the resurrection is a fact, and Watergate proved it to me. How? Because 12 men testified they had seen Jesus raised from the dead, then they proclaimed that truth for 40 years, never once denying it. Every one was beaten, tortured, stoned and put in prison. They would not have endured that if it weren't true. Watergate embroiled 12 of the most powerful men in the world-and they couldn't keep a lie for three weeks. You're telling me 12 apostles could keep a lie for 40 years? Absolutely impossible." 5. 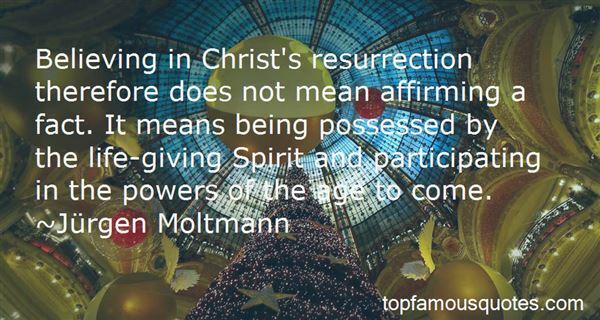 "Believing in Christ's resurrection therefore does not mean affirming a fact. It means being possessed by the life-giving Spirit and participating in the powers of the age to come." 6. "According to news reports, members of the sect believed in an assortment of pseudoreligious and paranormal ideas, including resurrection (obviously), astrology, and psychic powers. They were also avid watchers of paranormal shows on TV. This of course does not imply that watching The X-Files leads to suicide, just like millions of people playing Grand Theft Auto video games are not automatically turned into criminals on a rampage." 7. "Some of you seek for faith much in the same way as you would dig for a well. You turn the eye inward upon yourself and search amidst the depths of your polluted heart to find if faith is there; you search amid all your feelings at sermons and sacraments to see if faith is there; and still you find nothing but sin and disappointment. Learn Martha's plan. She looked full in the face of Jesus; she saw his dust-soiled feet and sullied garment, and his eye of more than human tenderness. She drank in his word: 'I am the resurrection and the life'; and in spite of all she saw and all she felt, she could not but believe. The discovery that Jesus made of his love and power, as the head of dead believers and the head of living believers, revived her fainting soul, and she cried: 'Yea, Lord, I believe.' 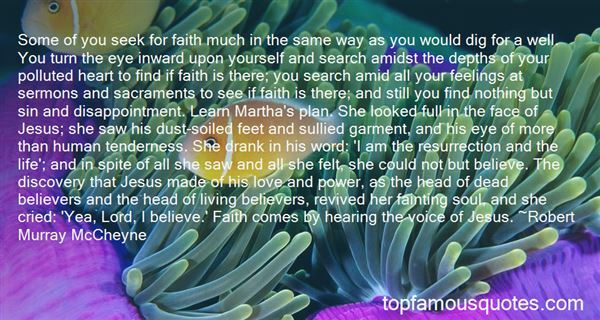 Faith comes by hearing the voice of Jesus." Beating the tea party gang is more important than who does the beating."